The design defect claim was not preempted by federal law and, on remand, will be considered by a jury. A verdict in favor of the engine maker on manufacturing defect and failure to warn claims was upheld. Based on a change in the law due to a decision issued by the Supreme Court of Washington (Estate of Becker v. AVCO Corp., 187 Wn.2d 615 (2017)), which was released after the trial of the matter here, an intermediate level state appellate panel, in an unpublished opinion, reversed the dismissal of a design defect claim against an aircraft engine manufacturer. However, the appellate court affirmed the jury's finding that the pilot was negligent and that his negligence was a proximate cause of the crash. 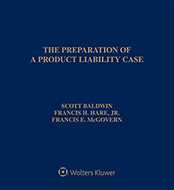 Moreover, the appellate court affirmed the jury's findings for the manufacturer on the manufacturing defect and failure to warn claims. The case was remanded for a trial limited to the questions of whether the engine was not reasonably safe as designed, whether any design defect was a proximate cause of the crash, and if so, how much fault to allocate between the manufacturer and pilot (Cavner v. Continental Motors, Inc., March 18, 2019, Andrus, B.). A crash of a personally owned plane resulted in serious injuries to the pilot, his wife, son, and babysitter, and another son was killed. The single-engine airplane crashed on takeoff after flying for one-half mile from an Anchorage, Alaska airport. The survivors and the estate of the deceased sued the aircraft engine manufacturer, Continental Motors, Inc. (CMI), under Washington's Product Liability Act, alleging design and manufacturing defect claims and a failure to warn claim. Based on precedent existing at the time of trial, the trial court dismissed the design defect claim, holding that it was preempted by federal law. The jury found against the pilot and passengers on their manufacturing defect and failure to warn claims and found the pilot 100 percent at fault. An appeal followed. The appellate court remanded the matter for the trial court to address whether CMI's engine was not reasonably safe as designed, whether any design defect was a proximate cause of the crash, and if so, how much fault to allocate between CMI and the pilot. Preemption—design defect. After the trial of this case, the Washington Supreme Court issued the Estate of Becker opinion holding that the Federal Aviation Act and FAA regulations did not preempt design defect claims under Washington's Product Liability Act [see Products Liability Law Daily’s January 27, 2017 analysis]. Because this resulted in a change of the law between the time of trial and this appeal, the appellate court concluded that the design defect claim must be reinstated. The jury's finding that pilot error was the sole cause of the crash would have precluded remand if the appellate court had concluded that the jury's finding would have been the same had the design defect claim been presented to it. The court could not make this finding. The pilot and passengers alleged that the engine's cylinders and valve lifters were defective in design, but the jury rendered no finding as to the existence of a design defect. The jury was asked only whether the engine was "not reasonably safe in construction" based on a manufacturing defect claim. Washington’s standard jury instructions for manufacturing defect claims and design defect claims differ materially. Without knowing whether the jury would have found a design defect, the appellate court could not assume the jury would have determined that such a design defect, if any, was not a proximate cause of the crash. Negligence. The appellate court affirmed the jury's finding that the pilot was negligent and that his negligence was a proximate cause of the crash. The pilot and passengers argued that the jury's finding should be reversed because the trial court erred in limiting evidence that the aircraft could fly safely in an overloaded condition and erred in admitting lay witness testimony that overloading the plane caused the crash. First, they argued that their experts' testimony regarding FAA ferry permits was "conditionally relevant" and should have been admitted under Washington Evidence Rule 104(b) to show that the plane could have qualified for an FAA permit to fly as much as 130 percent overweight. However, the appellate court ruled that by failing to raise an ER 104(b) objection at trial, the pilot and passengers waived this objection. Moreover, they presented extensive evidence that the aircraft in this case was able to haul substantial loads and still perform well, that it was "more than capable" of climbing at that weight and configuration, and that it actually flew for up to one-half mile before crashing. Next, the pilot and passengers asked the appellate court to reverse the finding of pilot negligence because the trial court erred in admitting lay opinion testimony about the cause of the crash. The appellate court noted that the evidence rules give the trial court considerable discretion in deciding whether opinion testimony would be helpful to the jury. Here, most of the objected-to testimony was simply witness recollections and impressions of what they heard and saw. Many of the eyewitnesses had significant aviation experience. While their impressions and observations benefitted from their piloting experience, none of them entered the realm of expert testimony by opining as to the cause of the crash. Failure to warn. The appellate court also affirmed the jury's findings for CMI on the manufacturing defect and failure to warn claims. The pilot and passengers sought a new trial on their failure to warn claim, arguing that the trial court abused its discretion in limiting the number of warranty claims they could present. At trial, the pilot and passengers offered 60 warranty claims that CMI had received over a period of 10 years to establish that CMI was on notice of compression or lifter problems in its engines. However, they did not explain how the 38 excluded warranty claims would have notified CMI of a danger when the 22 admitted warranty claims did not. If the trial court erred, the exclusion of cumulative "notice" evidence was not reversible error. Other issues. Finding that Washington State's interest in providing full compensation to tort victims and its interest in protecting persons from injuries from defective products outweighed any interest Alaska might have in protecting an out-of-state manufacturer, the appellate court affirmed the trial court's decision to apply Washington law. Moreover, the appellate court disagreed with the pilot and passengers’ contention that CMI's trial misconduct, when combined with the prejudice from other alleged errors, justified a new trial, and the appellate court saw no problem with the way the trial court cured CMI's nondisclosure of a technical drawing by recalling experts to testify at CMI's expense. Also, the appellate court was not swayed by CMI’s argument that the trial court erred in allowing the passengers to assert a contingent cross-claim against the pilot. The case is No. 76178-1. Attorneys: Kenneth W. Masters (Masters Law Group, PLLC) for Stacie Cavner and Hudson Cavner. Michael B. King (Carney Badley Spellman, PS) for Preston Cavner. Douglas A. Hofmann (Williams Kastner) for Continental Motors, Inc., Ace Aviation, Inc. and Northwest Seaplanes, Inc.
Companies: Continental Motors, Inc.; Ace Aviation, Inc.; Northwest Seaplanes, Inc.